I have a theory that everyone should have at least one really delicious soup recipe. This meatball soup might be mine. I’ve been on a soup-making kick lately, and tried this recipe last week. It was hearty and delicious, which was good since it made a pretty large batch (it lasted us almost a week!). It also cooks quickly, as far as soups go. Steve agreed it deserves a place in our regular meal rotation (though he says that about a good many dishes…what a great husband). Look out for my first meme (yeah, like a dork I had to look it up too), to be posted soon! Yay, I’m like a real blogger or something. In a medium bowl, combine egg, bread crumbs, onion, garlic powder and pepper. Add ground beef, and mix well. 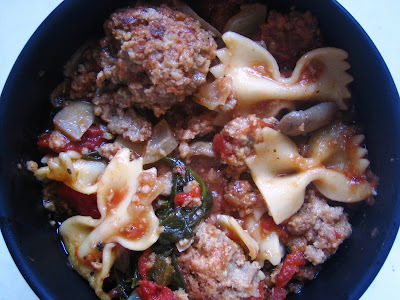 Shape meat mixture into thirty-six 3/4-inch meatballs. Lightly coat a large skillet with cooking spray. Cook meatballs over medium heat about 8 minute, turning occasionally to brown evenly. Set meatballs aside. In a large saucepan, stir together broth, tomatoes, mushrooms and water. Bring to boiling. Add pasta, and return to boiling. Reduce heat, and simmer covered for 10-12 minutes until pasta is tender. Stir in meatballs and spinach. Cook for 1-2 minutes until spinach wilts. Serves 5.
oh, so delicious. and the best part about soup is you can make a lot and have leftovers for days. Isn’t it so soup season? I keep wanting to get back to all of the recipes that I’ve bookmarked (like the fennel-crusted pork roast! ), but the only comforting solution to this 30-40 degree COLD is something in the liquid form of hot, steaming, savory goodess. Hot rice on the side with furikake is an added bonus! That looks delicious! I am definitely going to try it out. I am always looking for dishes with lots of leftovers, so I can eat those for lunch at the office instead of dreaded lean cuisines. Especially now that it’s (finally) getting colder outside, this recipe looks great! I love cooking and totally agree on the importance of a soup recipe!! Sounds like a good recipe. I’ll have to print it out. Thanks! That soup looks fantastic and perfect for when it finally gets cold…yummmm. This sounds delicious! I am a total “soup” person; I’m fairly certain I could live on them. I will definitely be trying this recipe! mmm… this looks so satisfying! yum!! !I agree with you — I have one homemade soup recipe that I love making. I think I want to make it my signature dush.